Earlier this year, Representative Fortenberry (R-NE) joined Representative Marcia Fudge (D-OH), Senator Thad Cochran (R-MS), and Senator Patrick Leahy (D-VT) in introducing the Farm to School Act of 2015 in both the U.S. House and Senate. The act would strengthen and expand the scope of the U.S. Department of Agriculture’s Farm to School Grant programs to assist more schools in developing Farm to School nutrition programs. Mel Maendele, Norris Food Service Director and part of our Nebraska Farm to School pilot program, came up with local produce options to feature during Farm to School Month. Norris food service professionals displayed apples, sweet potatoes, and pumpkins throughout their schools to visually show the students the fall produce available during October. Each week they also showcased local produce with an educational slide show and hands-on lessons in several classrooms. Mel hopes to create lasting impressions on the students. 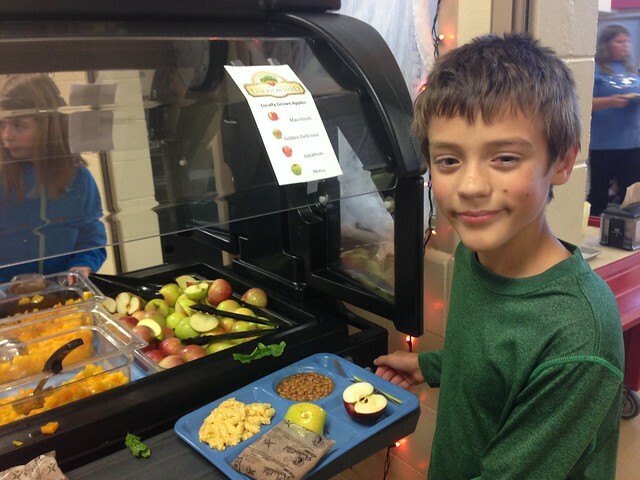 Despite the $1.24 per meal food service budget per student, Norris is working hard to provide students with healthy food ideas they can share with their families. When Mel talked to me, she said how great it was to see Congressman Fortenberry in their lunchroom, to see the kids sampling local apples, and to show him the value of Farm to School efforts and how much the students appreciate and respond to fresh, local food. "Members of Congress have a fast and furious schedule, so having him take the time to see our lunchroom and taste apples with the students was a really big deal,” she added. During October, Norris students also helped snap fresh green beans from Abie Vegetable People in Abie, Nebraska. While the help was valuable, Mel believes it also provides a greater understanding among the students of how food makes it to their plates. While Mel sees more on the horizon for the Norris School District's Farm to School program, she cautioned that schools cannot outpace available Farm to School funding. In 2014, the Norris School kitchen featured local produce on one day in the fall. This year they featured local food one day each week in October. "We don't want to bite it all off at once. We want to grow the program, but in a sustainable manner." All of which makes the advancement of Representative Fortenberry’s Farm to School Act that much more important. You can see more photos of Representative Fortenberry’s visit to Norris School District here. And you can sign on to support the Farm to School Act of 2015 here. Feature photo: Nebraska Representative Jeff Fortenberry was on hand at Norris Public Schools to help celebrate Apple Crunch day. Sarah Smith, our Farm to School Lead, looks on with delight. Below you will find more photos from the day.